One of the greatest, and, withal, the most serious objection to the correctness and reliability of the whole work will be the preliminary Stanzas: “How can the statements contained in them be verified?” True, if a great portion of the Sanskrit, Chinese, and Mongolian works quoted in the present volumes are known to some Orientalists, the chief work — that one from which the Stanzas are given — is not in the possession of European Libraries. The Book of Dzyan (or “Dzan”) is utterly unknown to our Philologists, or at any rate was never heard of by them under its present name. This is, of course, a great drawback to those who follow the methods of research prescribed by official Science; but to the students of Occultism, and to every genuine Occultist, this will be of little moment. The main body of the Doctrines given is found scattered throughout hundreds and thousands of Sanskrit MSS., some already translated — disfigured in their interpretations, as usual, — others still awaiting their turn. Every scholar, therefore, has an opportunity of verifying the statements herein made, and of checking most of the quotations. A few new facts (new to the profane Orientalist, only) and passages quoted from the Commentaries will be found difficult to trace. Several of the teachings, also, have hitherto been transmitted orally: yet even those are in every instance hinted at in the almost countless volumes of Brahminical, Chinese and Tibetan temple-literature. However it may be, and whatsoever is in store for the writer through malevolent criticism, one fact is quite certain. 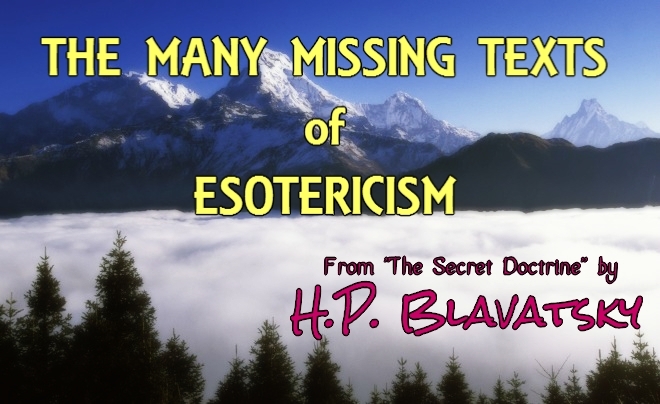 The members of several esoteric schools — the seat of which is beyond the Himalayas, and whose ramifications may be found in China, Japan, India, Tibet, and even in Syria, besides South America — claim to have in their possession the sum total of sacred and philosophical works in MSS. and type: all the works, in fact, that have ever been written, in whatever language or characters, since the art of writing began; from the ideographic hieroglyphs down to the alphabet of Cadmus and the Devanagari. It is maintained, furthermore, that every sacred book of that kind, whose text was not sufficiently veiled in symbolism, or which had any direct references to the ancient mysteries, after having been carefully copied in cryptographic characters, such as to defy the art of the best and cleverest palaeographer, was also destroyed to the last copy. During Akbar’s reign, some fanatical courtiers, displeased at the Emperor’s sinful prying into the religions of the infidels, themselves helped the Brahmans to conceal their MSS. Such was Badaoni, who had an undisguised horror for Akbar’s mania for idolatrous religions. Moreover in all the large and wealthy lamasaries, there are subterranean crypts and cave-libraries, cut in the rock, whenever the gonpa and the lhakhang are situated in the mountains. Beyond the Western Tsay-dam, in the solitary passes of Kuen-lun [“Karakorum mountains, Western Tibet.”] there are several such hiding-places. Along the ridge of Altyn-Toga, whose soil no European foot has ever trodden so far, there exists a certain hamlet, lost in a deep gorge. It is a small cluster of houses, a hamlet rather than a monastery, with a poor-looking temple in it, with one old lama, a hermit, living near by to watch it. Pilgrims say that the subterranean galleries and halls under it contain a collection of books, the number of which, according to the accounts given, is too large to find room even in the British Museum. All this is very likely to provoke a smile of doubt. But then, before the reader rejects the truthfulness of the reports, let him pause and reflect over the following well known facts. The collective researches of the Orientalists, and especially the labours of late years of the students of comparative Philology and the Science of Religions have led them to ascertain as follows: An immense, incalculable number of MSS., and even printed works known to have existed, are now to be found no more. They have disappeared without leaving the slightest trace behind them. Were they works of no importance they might, in the natural course of time, have been left to perish, and their very names would have been obliterated from human memory. But it is not so; for, as now ascertained, most of them contained the true keys to works still extant, and entirely incomprehensible, for the greater portion of their readers, without those additional volumes of Commentaries and explanations. Such are, for instance, the works of Lao-tse, the predecessor of Confucius. He is said to have written 930 books on Ethics and religions, and seventy on magic, one thousand in all. His great work, however, the heart of his doctrine, the “Tao-te-King,” or the sacred scriptures of the Taosse, has in it, as Stanislas Julien shows, only “about 5,000 words” (Tao-te-King, p. xxvii. ), hardly a dozen of pages, yet Professor Max Muller finds that “the text is unintelligible without commentaries, so that Mr. Julien had to consult more than sixty commentators for the purpose of his translation,” the earliest going back as far as the year 163 B.C., not earlier, as we see. During the four centuries and a half that preceded this earliest of the commentators there was ample time to veil the true Lao-tse doctrine from all but his initiated priests. The Japanese, among whom are now to be found the most learned of the priests and followers of Lao-tse, simply laugh at the blunders and hypotheses of the European Chinese scholars; and tradition affirms that the commentaries to which our Western Sinologues have access are not the real occult records, but intentional veils, and that the true commentaries, as well as almost all the texts, have long since disappeared from the eyes of the profane. . . . Turning now to the oldest Aryan literature, the Rig-Veda, the student will find, following strictly in this the data furnished by the said Orientalists themselves, that, although the Rig-Veda contains only “about 10,580 verses, or 1,028 hymns,” in spite of the Brahmanas and the mass of glosses and commentaries, it is not understood correctly to this day. Why is this so? Evidently because the Brahmanas, “the scholastic and oldest treatises on the primitive hymns,” themselves require a key, which the Orientalists have failed to secure. What do the scholars say of Buddhist literature? Have they got it in its completeness? Assuredly not. Notwithstanding the 325 volumes of the Kanjur and the Tanjur of the Northern Buddhists, each volume we are told, “weighing from four to five pounds,” nothing, in truth, is known of Lamaism. Yet, the sacred canon of the Southern Church is said to contain 29,368,000 letters in the Saddharma alankara, or, exclusive of treatises and commentaries, “five or six times the amount of the matter contained in the Bible,” the latter, in the words of Professor Max Muller, rejoicing only in 3,567,180 letters. Notwithstanding, then, these “325 volumes” (in reality there are 333, Kanjur comprising 108, and Tanjur 225 volumes), “the translators, instead of supplying us with correct versions, have interwoven them with their own commentaries, for the purpose of justifying the dogmas of their several schools.” Moreover, “according to a tradition preserved by the Buddhist schools, both of the South and of the North, the sacred Buddhist Canon comprised originally 80,000 or 84,000 tracts, but most of them were lost, so that there remained but 6,000,” the professor tells his audiences. “Lost” as usual for Europeans. But who can be quite sure that they are likewise lost for Buddhists and Brahmins? Considering the sacredness for the Buddhists of every line written upon Buddha or his “Good Law,” the loss of nearly 76,000 tracts does seem miraculous. Had it been vice versa, every one acquainted with the natural course of events would subscribe to the statement that, of these 76,000, five or six thousand treatises might have been destroyed during the persecutions in, and emigrations from, India. But as it is well ascertained that Buddhist Arhats began their religious exodus, for the purpose of propagating the new faith beyond Kashmir and the Himalayas, as early as the year 300 before our era, and reached China in the year 61 a.d. when Kashyapa, at the invitation of the Emperor Ming-ti, went there to acquaint the “Son of Heaven” with the tenets of Buddhism, it does seem strange to hear the Orientalists speaking of such a loss as though it were really possible. They do not seem to allow for one moment the possibility that the texts may be lost only for West and for themselves; or, that the Asiatic people should have the unparalleled boldness to keep their most sacred records out of the reach of foreigners, thus refusing to deliver them to the profanation and misuse of races even so “vastly superior” to themselves. . . . Questioned further on this point, he would say no more. This was at Meerut, in 1880. . . . This statement is rendered more credible by a consideration of the following facts: the tradition of the thousands of ancient parchments saved when the Alexandrian library was destroyed; the thousands of Sanskrit works which disappeared in India in the reign of Akbar; the universal tradition in China and Japan that the true old texts with the commentaries, which alone make them comprehensible — amounting to many thousands of volumes — have long passed out of the reach of profane hands; the disappearance of the vast sacred and occult literature of Babylon; the loss of those keys which alone could solve the thousand riddles of the Egyptian hieroglyphic records; the tradition in India that the real secret commentaries which alone make the Veda intelligible, though no longer visible to profane eyes, still remain for the initiate, hidden in secret caves and crypts; and an identical belief among the Buddhists, with regard to their secret books. For it is not the fault of the initiates that these documents are now “lost” to the profane; nor was their policy dictated by selfishness, or any desire to monopolise the life-giving sacred lore. There were portions of the Secret Science that for incalculable ages had to remain concealed from the profane gaze. But this was because to impart to the unprepared multitude secrets of such tremendous importance, was equivalent to giving a child a lighted candle in a powder magazine. The danger was this: Doctrines such as the planetary chain, or the seven races, at once give a clue to the seven-fold nature of man, for each principle is correlated to a plane, a planet, and a race; and the human principles are, on every plane, correlated to seven-fold occult forces — those of the higher planes being of tremendous power. So that any septenary division at once gives a clue to tremendous occult powers, the abuse of which would cause incalculable evil to humanity. A clue, which is, perhaps, no clue to the present generation — especially the Westerns — protected as they are by their very blindness and ignorant materialistic disbelief in the occult; but a clue which would, nevertheless, have been very real in the early centuries of the Christian era, to people fully convinced of the reality of occultism, and entering a cycle of degradation, which made them rife for abuse of occult powers and sorcery of the worst description. The documents were concealed, it is true, but the knowledge itself and its actual existence had never been made a secret of by the Hierophants of the Temple, wherein Mysteries have ever been made a discipline and stimulus to virtue. This is very old news, and was repeatedly made known by the great adepts, from Pythagoras and Plato down to the Neoplatonists. It was the new religion of the Nazarenes that wrought a change for the worse — in the policy of centuries. To discover more about the Secret Doctrine itself as well as the book titled “The Secret Doctrine,” please take a look at such articles as Theosophy: The Ancient Wisdom, 12 Things Theosophy Teaches, Unity of the World’s Religions, An Invitation to The Secret Doctrine, Who wrote “The Secret Doctrine”?, What do we mean by Occult?, Esoteric Symbolism, Why does Theosophy deny the Miraculous and Supernatural?, The Importance of Supporting Evidence, The Two Paths, Original Theosophy and Later Versions, Gandhi on Blavatsky and Theosophy, The Letter from the Maha Chohan, The Masters and Madame Blavatsky, Responding to Lies about H.P. Blavatsky, Praise for H.P. Blavatsky and Theosophy, The Closing Cycle, The Psychic is not the Spiritual, Blavatsky defeats an Atheist, Theosophy, The Jesuits & The Roman Catholic Church, and How to successfully study the Teachings of H.P. Blavatsky. You may also like the Books on Theosophy page.